Glorious Friday, what a day! As we gently prepare for the advent of more rain here in the burbs, all eyes are on the two reservoirs, levees and the dams that contain the mighty waters of the accumulated rains and will they hold? We sure hope so. In the meantime, crab a cup of java and let’s chew the proverbial fat. It’s time for Bacon! This Wednesday past, I had an outing in the evening to another favorite watering hole and Mexican food emporium here in the burbs. Out here, we have an interesting mix of the chains and family owned restaurants. If you want to go where the locals go, follow the local crowds. Enchiludas is where we head on Wednesday as it is biker night there and the food is excellent! Enchiludas is owned and operated by Pepe and Gladys, a couple that has a long history of being in the restaurant industry here in Houston. The food is quite interesting and the new menu encapsulates the wonders of Tex Mex cuisine into a sometimes delicate art form. One of my faves is Ceviche. It’s not on the menu but if I am planning to go there, I call ahead and get Pepe to make it. Then, it’s a feast of Ceviche, Queso Flamado, Chips, homemade Salsa, Margaritas and a lot of fun. There is no pretense here, just good food and good friends. You might ask, why are we hanging around bikers? Well, I’ll be honest, I would rather hang around people that are comfortable in their skins and that have my back. Enchiludas has a great policy that everyone is welcome from families to party animals and we all cohabit together in Margarita bliss for the evening. 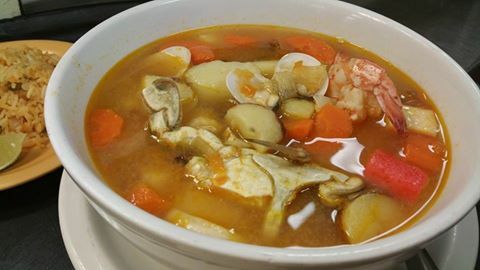 Another favorite on the menu is the Seafood Soup that can be custom made by Pepe and the staff there that includes tilapia, muscles, crab, shrimp, octopus and sometimes even crawfish! 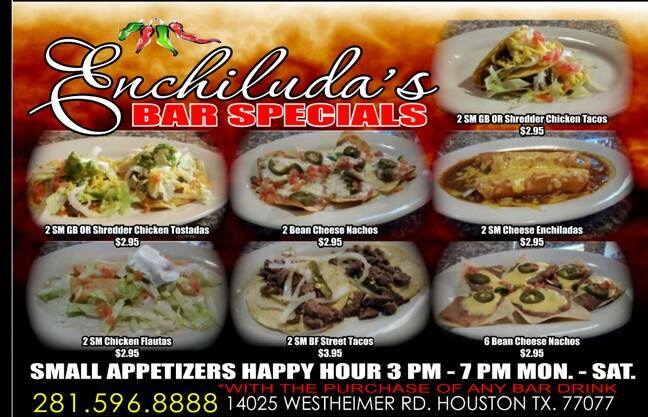 Enchiludas also serves up a great Crawfish boil that is not that pricey and a great bargain! The band that evening was a Rhythm and Blues duo that took me back to my roots in Memphis, Tennessee. Man, these cats were cooking with gas! Two brothers, known as the “Black Cats” with some interesting professional experiences that we shared during their breaks. Other menu items that are of note include the Enchilada plates varying in price, the Burritos that are humongous, the Shrimp wrapped in bacon and embedded in a fresh jalapeno and the variations on Chorizo! Yum Yum! Have a great weekend! If we float by, grab the cooler and refill it please! From Casa Ukitena in the Burbs of Houston. From the Burbs of West Houston! Greetings and salutations in the suburbs of Houston! It’s great to be writing this blog and as this is the beginning of a new day for me, I would like to start off by saying we lived in the suburbs of Houston. Now you may ask, Houston is so big, where the suburbs? I’m particular HOA is located outside the Beltway’s which means you have to have two green cards to get here. We also live in a floodplain which can be quite interesting concerning the recent floods we’ve had here. All that aside, we live in a very diverse. Houston. The restaurants in this area are not five-star they are more family oriented which is very unique. One of our favorite places to go is El Matador. El Matador is an interesting neighborhood establishment where every Tuesday night, Rodney plays the piano or tickles the ivories as the case may be. Writing has been playing for a long time and we know we are at home when I hear the music I grew up with and realize I’m a bit ancient, hee hee hee hee. The food at EL Matador is a mix of Tex-Mex, Colombian and pure Mexican. Of course I like margaritas but isn’t that what a househusband would like? On Wednesday usually consist of going into town which is a great effort on our part. I tell my spouse Jody, but I can drive from Memphis to Jackson, Tennessee quicker than we can get downtown Houston. However, with the advent of the Westpark toll way, it cuts down on driving time for about 15 minutes depending on traffic. Of course, one must take into account the highway 59 parking lot as it can be atrocious at times. Going into town, we usually hang out in the Montrose area. Montrose area in Houston is a hot spot for multicultural experience, something I really treasure! We lovingly refer to Georges Country Sports Bar as the Cathedral of St. George since that’s where we gather together, especially on Sunday afternoon. Beginning on Wednesday, I attempt to make the vestry committee meeting. There a lot of plans have to be made for the Sunday services at Georges. Oh, sorry. What I meant to say is that the Cathedral. “This is right up there at the top of the list for a bar outing in Houston Montrose area. Great bartenders, good drinks and usually some club function going on. OH, and Sunday’s, football season, come in for a great crowd to watch the games along with dollar vodka’s. There are a lot of restaurants in that area that Jody and I really like. The go to place for us is Barnaby’s! Barnaby’s has the menu that will knock your socks off. The serving sizes are enough that when we order separate meals we had enough for the next day. I usually like the salads and Jody really likes the chicken WONTONS. He likes of so much that even the hot sauce we had to find the Chinese markets. Next place we like is the Ripcord! The Ripcord has undergone some changes from a full-time leather bar to more of an open community gathering spot. The owner, Brad, has opened up the space and invited artists in various disciplines and to show and promote their wares. Speaking of wares, Chip Ware and his spouse have opened up a new shop in the Ripcord. I highly recommend Montrose area of Houston. Getting back to West Houston, the homeowners association here seems to be operating still in the 80s. Me, I am a creative type person and I need room to breathe. Perhaps there is a chance to turn things around and install solar panels, a usable landscape, more economical energy-saving products and bring things up to speed with 21st century. Now, in Texas, the homeowners associations are very powerful and seem to be able to get away with anything. So, I have to learn to work within the system and change it. So, what is a Houston househusband to do at a time like this? Leave it for squeezing it? Fit in or stand out? I believe it’s time for a cocktail or better yet a cigar and a glass of sweet tea on the veranda that doesn’t exist yet. Blasted homeowners associations that I have to draw up plans and submit for approval around in the backyard. Oh well enough for now, see you next time! Today I am listening to spotify, some of my recordings and those of friends I have worked with around the world. Being an artist is a treasure I hold dearly in my life and apply artistic aspects to everything I do. My canvas is sound at times and I love painting with sound. Music is my primary language and an escape from a rather hectic world. I am in my easy chair with Ms. Ethel on my lap and the Duker vying for attention at my feet. These are our kids as we call them and all rescue animals that just showed up on our doorstep. The music today is taking me back to Memphis, Tennessee, home of the blues, culture, Memphis in May, The outstanding Memphis Symphony and Germantown. It is also the home of the Rendevous and Interstate BBQ of food network fame. I have an interesting history with these establishments both musically and in the kitchen. Heck, I grew up there and love the taste and feel of the city! We have cooked side by side at many events across the Memphis/Shelby County area to the joy of many! Enough of that about me and on to my reasons for sharing today. There is a lot going on around the world right now. Mr. Paul Pellay is having a composition of his premiered by a highly capable Violinist. Paul and I go back decades and he is married to a great violist, Michelle Pellay-Walker that I consider my sister from another mother. This performance is taking place in Jolly Old England. On the other side of the world, the the Pacific Northwest, Dr. Justin Smith, Director of Choirs at Maryhurst University is preparing from the summer. Stay Tuned! Things are heating up here in Houston also! But for today, I am relaxing before the weekend when Jody and I celebrate our 16th anniversary of being together. We were officially MARRIED in November of 2014. We are having a casual at home BBQ where Tennessee meets Texas! 16 years ago, on April 1, I arrived in Houston to begin a life with Jody Turner. It’s been an up and downhill roller coaster ride but we are still together these 16 years later! We would like to cordially invite you to our home on Sunday, April 3, 2016 for a Tennessee meets Texas BBQ in honor of this decade plus of being together. A lot has happened in these years and it’s time to celebrate. Stop by for good times, good friends, good food and some all out fun! Please pardon the house as it is now a DYI project that will be ongoing for a bit. I am also taking the liberty of creating videos of the work as it progresses along with recipes, exploring Jere’s kitchen and teaching videos for clarinet excellence. If perchance, anyone would be considering an anniversary present, we need help on the renovations to the house! We look forward to seeing everyone! Recipes and menus will be here later but today, I am having fun with our mischevious kids! Ta Ta for now and have a great day! An Iconic Restaurant closed in Houston yesterday evening. 59 Diner. This is a shame as I really liked this restaurant! This is a recipe I obtained from the Dietician that was employed by my family in Milan, Tennessee. It is always a hit and even Jody, that does not really like broccoli, really enjoys this one! The Pipeline in Memphis was a leather bar that came on the scene in the eighties. Owned by Dennis and Stan, they pushed me to develop recipes using all natural ingredients for the infamous Sunday afternoon buffet and beer bust. There were also special events such as the pool tournaments where they demanded excellent foods sourced from local super markets and wholesale venues. There was always an event planned at the Pipeline and that involved the kitchen. Mr. Leather Tennessee brought in people from around the world to our little place and we went to great lengths to prepare! There were also seasonal events including Mardi Gras, Cookouts, the Pipette Fourth of July benefit and other big feeds. We also coordinated with Memphis In May with a month of selections from the cuisine of the recognized nation that year. That was a challenge for me and yet I expanded my horizons as more was asked. The challenge for me was to being excellent cuisine on a small budget. I accomplished that by taking standard fare and expanding with noodles into casseroles and such. The big events called for me personally developing as a chef and putting out a varied international cuisine. The Pipeline kitchen was a pass through from the office to the back bar and it amazed me how we could turn out some fabulous meals in short order. I learned a lot there and am grateful for the Widow McCain, the Manager, Jeff Hardy and for the wonderful people of Memphis!